First and most importantly, I am a father of three beautiful girls; Sophie, Genevieve and Reese. My bride, Sarah and I have been married for 10 years. 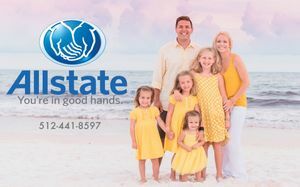 We strive everyday to treat the customers like family because next to God, family is most important to our agency. I am a third generation insurance agent. Allstate being two of those generations. My 18 years of experience have equipped me to help you protect your family from more than car wrecks and home emergencies. My passion is being there to help provide stability during difficult times and unforeseen circumstances like loosing a loved one.